DYS hosts an annual Scholarship, Solo & Concerto Competition exclusively for it’s musicians. Auditions are held each January at the Ford Community & Performing Arts Center, and adjudicators from outside the organization are enlisted to evaluate the musicians. Each applicant receives a written evaluation by the adjudicators from the audition. Ultimately, attendance, attitude and overall contribution to the ensemble will be strongly considered. Soloists perform at the March concert. Concerto musicians, along with any Symphony Orchestra soloists, perform at the May concert. Scholarships are also presented at the May concert. Each concert season, DYS awards thousands of dollars in scholarships to our member musicians. Auditions may be scheduled online starting in early December. Watch your email, the newsletter and Facebook page for more details. 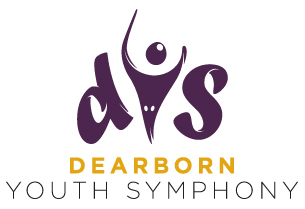 Special thanks to the Friends of the Dearborn Symphony Orchestra for their generous scholarship support. Applicants must be a DYS member in good standing. Applicants must not have more than two (2) unexcused absences. Applicants may play with sheet music at time of audition but piece must be memorized at time of performance. Accompaniment is not allowed for the audition. Applicants must have performed in the first concert of the season and anticipate performing in the second and third. Scholarships will only be awarded to musicians who participate in all three concerts. The one audition will be used for all registered competitions. Musicians will have the opportunity choose if they would like to audition for the solo, concerto and/or scholarship when completing the audition registration. Click here to Download your copy of DYS Solo Scholarship & Concerto Audition Form to be uploaded soon.